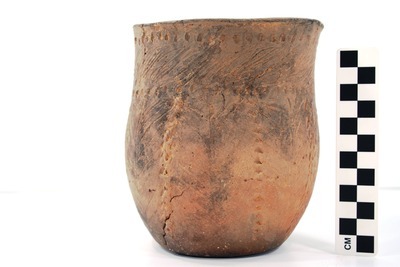 "41UR315, Vessel A 36 SS" by Timothy K. Perttula and Robert Z. Selden Jr.
DECORATION (INCLUDING MOTIF AND ELEMENTS WHEN APPARENT): The vessel rim is decorated with diagonal incised lines that encircle the vessel. There are also two rows of tool punctations, one just below the lip and the other at the rim-body juncture. The vessel body is divided into eight panels by vertical rows of triangular tool punctations. Each panel is then subdivided by a single vertical incised line, and there are incised lines radiating in opposite directions from this central incised line. Pease Brushed-Incised jar, Vessel A36, SS.